Remember when surfers collectively salivated at each new Surf Snowdonia video clip? It’s only been a few years since the world’s first surf-specific-human-made-wave facility opened up. And now look. The wave pool clip-o-sphere has hit hyperspace. So much so that we’ve been digitally blinded by wave pool clips from new technology like Surf Lakes, The Cove and American Wave Machines. But the Welsh wave pool was the first to stoke our freshwater surf jones. Built on the site of an abandoned aluminium mine, Surf Snowdonia cost £18million to build. The surf is generated by Wavegarden’s Lagoon technology which is quite different from their current Cove technology being promoted globally. Surfers are charged £40-£50 for a one hour session that usually gets them 11-12 waves. We thought it was time to be kind and rewind a little and examine some rare Snowdonia digital gems before we usher in the official transformation from Surf Snowdonia to Snowdonia Adventure Parc. 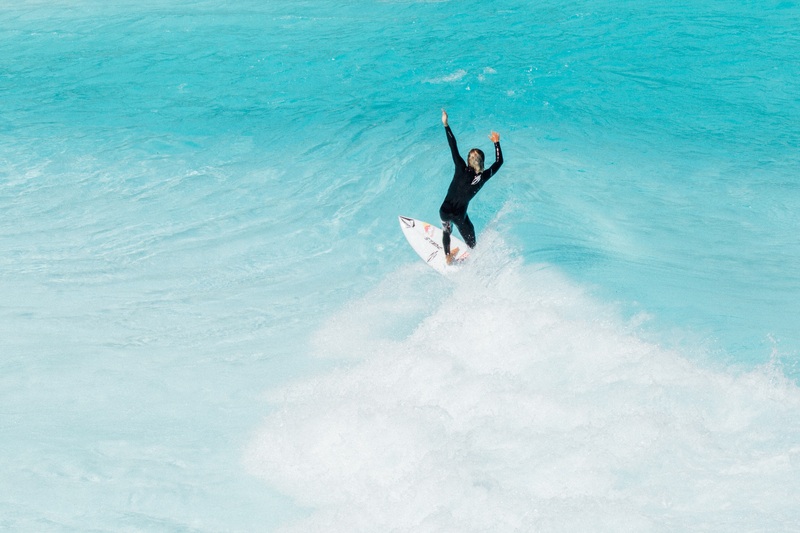 GoPro founder and surfing’s first billionaire (on paper at the time) Nick Woodman took team rider Kalani Robb to Surf Snowdonia when the park launched. In true POV GoPro style the duo tag team the lefts. This clip is noteworthy because it was the first time computer jockeys and those of us outside the park got to experience it first hand via POV. Be warned, the high-five ratio is pretty high on this one. Jordy Smith and O’Neill have made a second home in Northern Wales. Each year the big South African makes a trip to the peeling rights and lefts to practice his runs. Smith is a big guy, and his performance and power in small “fun” surf is a testament to his strength. This YouTube series is based on the antics and travels of two self-proclaimed so-so UK surfers. Hannah Bristow and Dannie Maclegend take to the brown freshwater waves and it’s a great illustration of the average surfer’s ability at Snowdonia. The shralp factor gets a huge boost when their friend Sara Taylor from Huntington Beach joins them. The first UK Pro Surf Tour event on a manmade wave. This event was a huge success: unique format, great turnout and fantastic atmosphere. During the competitive year, there are always a few events on the UK Pro Surf Tour that get cancelled or postponed due to unfavourable conditions. This stop is a rare guaranteed event. Back at it with O’Neill, Jordy Smith promotes the Technobutter3 Psycho wetsuit in a spastically edited night time surfing clip. While short on surfing and heavy on the “spooky” editing effects, we catch a glimpse of Jordy’s mastery at Snowdonia. The man is simply amazing, effortlessly sliding his huge frame through power carves. One of the best visual tours from above and alongside the former aluminium mine was done by EPL Imagnes Aereas. It’s not Jordy, Kalani or Jo Dennison ripping, but average surfers like you and I taking to the olive brown peelers both on shortboard and foamie. We’ve included this clip because it gives a great unbiased look at the wave at Surf Snowdonia without the glamour edits to make the wave look better than it really is. You see what you get. The unidentified tourguide gives us 10 minutes of behind-the-scenes Surf Snowdonia and opinion. It’s thorough. The clip has lots of peripheral information and will be super helpful to anyone planning a trip to Snowdonia Adventure Parc. However the film maker’s rating system is bit random as the park receives 4.5 stars out of 5, but we’re not sure why. Red launched the first wave pool comp in typically innovative Red Bull fashion. The energy drink company delivered a new format for competitors with a best of five waves format. Brad Gerlach, Jarred Howse and Jake Paterson add an air of veteran sensibility to the whole spectacle. But after four rounds New Zealand’s Billy Stairmand and Hawaii’s Albee Layer met in the final with Layer taking the win. In subsequent interviews the Hawaiian confessed he planned his heats the way a snowboarder plans Olympic runs. This strategy is becoming the norm for wave pool competitiors. Watch as Wavegarden’s original Lagoon technology becomes a skatepark of sorts as professional wakeboarder Nico von Lerchenfeld grabs a cable and gets towed through the pond to land some new tricks in a wave pool. In this case, it’s the world’s first wall ride. The German virtuoso ollies a wave from out the back and slides off the main wall of the former aluminum mine site to complete the world’s first wall ride in a wave pool.